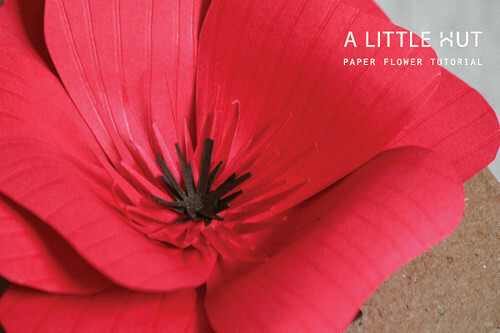 This is a flower that I put together for a series of projects that I've been working on for the shop. I was going to include it with the Petal Collection, but I decided that this was one worth sharing. It doesn't require any fancy equipment at all! 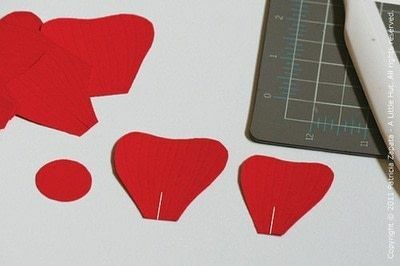 Cut out 8 petals that are similar to a heart shape but with a flat bottom. Notice how my petals aren't exactly symmetrical—they don't need to be. Six should be about 2" (5cm) tall and 2" (5cm) at it widest point. 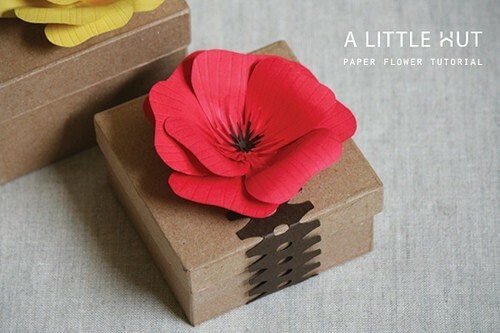 Cut 2 petals that are smaller—about 1.5" (4cm) in height and the same at their widest point. Cut out one circle that is 1" (2.5cm). wide. Cut the center of each petal about 1/2" (13mm) vertically, as shown by the white lines in the photo below. 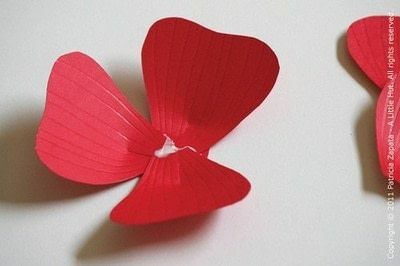 Score each petal vertically (following the curve of the outer edges), several times until the entire petal is marked. Do the scoring on a cutting mat. The soft surface helps the bone folder sink into the paper and protects your table! Slightly overlap and glue the two bottom tabs that are formed by the split petal base. 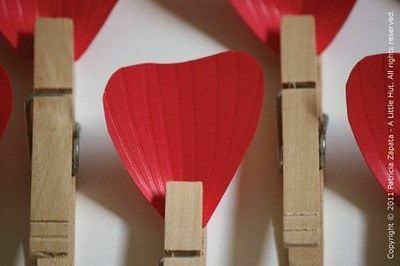 Use the clothespins to hold the petals together until they are dry. Glue 3 large petals to the circle base. Add the 3 remaining large petals in the center of the flower. Attach the 2 smaller petals last. Cut out 2 brown star shapes and 2 larger red star shapes. They don't need to be exact, as you can see by my crooked versions. Just make sure that the brown ones fit inside the red ones. 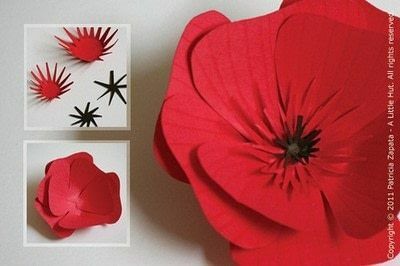 Glue them all together, fold the spikes vertically and attach them to the center of the flower. The final step is to fold the edges of the flower petals outward. Done! This looks so fancy and elegant but your directions make it seem easy! I like it!